Students have always responded powerfully to the memorable stories, poems, plays, and essays gathered in distinctive clusters in Making Literature Matter’s thematic anthology. At the same time, the book’s chapters on reading, writing and research help students harness those responses into persuasive, well-supported arguments about the issues raised by the literature. 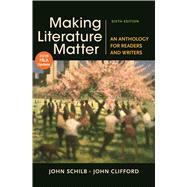 As ever, the new edition of Making Literature Matter reflects John Schilb and John Clifford’s careful attention to emerging pedagogical needs and trends. In response to instructor requests, they have expanded their treatment of argumentation and research, and refined their approach to literary genres. Further, they read widely to identify some of the most engaging fiction, poetry, drama, and nonfiction published recently, and based their new choices for the sixth edition on how well that literature raises and explores issues that matter to students right now. 1. What Is Literature? How and Why Does It Matter? How Have People Defined Literature? What Can You Do to Make Literature Matter to Others? *Trish Carlisle, Which Is the Stronger Actress in August Strindberg’s Play? *Elizabeth Barrett Browning, How Do I Love Thee? Emily Dickinson, Wild Nights--Wild Nights! *Emily Dickinson, I’m Nobody! Who are you? *Jeffrey Toobin, Edward Snowden’s Real Impact. Ray Bradbury, Mars Is Heaven!